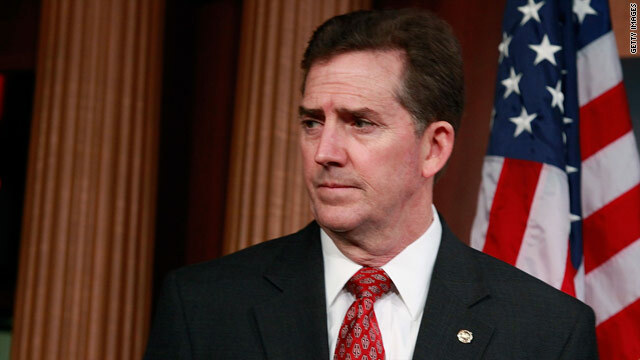 Sen. Jim DeMint, R-South Carolina, has focused on building up the conservative base in the Republican Party. Observer: He is the "thinking person's Sarah Palin"
Washington (CNN) -- Jim DeMint has a message to the Washington political establishment: An "American awakening" is taking place across the country, as seen in the Tea Party-backed Rand Paul's win in Kentucky's Republican Senate primary. "It shows that Americans want strong leaders who will stand up to the massive spending, bailouts, and debt in Washington that are bankrupting our country," DeMint said in a statement. Among conservatives and Tea Party groups, DeMint -- a first-term Republican senator from South Carolina -- has become a political heavyweight, lending conservative credentials and financial resources to little-known, outside-the-beltway candidates. His efforts, an expert said, is geared towards building support for himself with the conservative base and positioning himself as a leading voice in the anti-Washington movement. "I would characterize his efforts to position himself as an attempt to be seen as the thinking person's Sarah Palin," said Jeremy Mayer, a political scientist and professor of public policy at George Mason University. "He has a lot of the same positions as Sarah Palin, he speaks to a lot of the same constituencies but he has a much longer record of public service" and isn't as polarizing. DeMint's national profile has risen since he broke with many Republicans last year to endorse Marco Rubio in Florida for U.S. Senate. It happened long before the former state House speaker became the favorite to win the GOP nomination over Gov. Charlie Crist, who recently switched his party affiliation to run as an independent. DeMint, a former congressman, has also used his Senate Conservatives Fund -- a political action committee -- to promote and raise money for other conservatives in competitive Senate primaries. As of March 31, his group contributed, raised, bundled or spent money for four candidates: $343,464 to Rubio; $150,947 to Chuck DeVore in California; $60,870 to Pat Toomey in Pennsylvania; $32,981 for Michael Williams in Texas. On May 5, DeMint endorsed Paul. According to the SCF website, more than $26,000 had been raised for the son of Rep. Ron Paul, R-Texas. Paul won that primary Tuesday night. His support for outsider candidates isn't necessarily paying off. DeMint's PAC contributed more than $210,000 in the final two weeks of the Indiana Senate primary for Marlin Stutzman, who lost the race to former Sen. Dan Coats, a Republican establishment candidate. Despite the losses, political observers have taken note of DeMint's candor, financial prowess and ability to step outside the party to push for a more conservative party. "This is the year to be the outsider and folks running against Washington," said Alex Vogel, a Republican strategist, in noting DeMint's active campaigning for 2010 candidates. "At the end of the day, having this kind of debate inside the party -- having passionate advocates on all sides -- is a good thing," said Vogel, a former chief counsel to the National Republican Senatorial Campaign Committee. "I think it's great [what he's doing]." And DeMint isn't shy in criticizing his party. "I'm afraid we're causing a little trouble for the establishment," he told a crowd at the Conservative Political Action Committee conference on February 18. "When Republican senators don't do the things they say they believe, voters should have a choice of a new Republican ... a real Republican." While DeMint is running in South Carolina's June 8 Republican primary to keep his Senate seat, it seems that there's something bigger on the horizon, Mayer said. "As they say, 'Most senators wake up in the morning, and they see a president in the mirror,' " he said. "I think DeMint is seeing more president than most senators." But Vogel said DeMint is not necessarily a well-known figure to capture a nationwide primary race for the GOP's top spot in 2012. "We have a truly open process, and I'm all for a lot of people running in a primary that produces the best candidate," he said. "Do I think that Sen. DeMint is sitting in the captain's seat? I'd say no." Another card DeMint could play? Positioning himself as the No. 2 on the Republican presidential ticket. "If [Minnesota Gov. Tim] Pawlenty takes the nomination say in 2012, DeMint would make a nice balance to Pawlenty -- Midwest versus Deep South and Senate versus governor, inside/outside Washington ticket-balancing," Mayer said. Mayer predicted DeMint will likely send out trial balloons in 2011 and if there's active interest in Iowa and New Hampshire, he'll enter. "If there's not, he'll hold back and wait for someone to see him as a vice president." If those dreams shouldn't play out, would DeMint gun for a more prominent role in the Senate -- perhaps even McConnell's job? "I don't see DeMint as being interested in McConnell's job. ... That's such an inside-the-Beltway position," Mayer said. "You have to spend your time with the minutiae of Senate procedure. And that's not so much DeMint's bread and butter. He's been in Congress for a number of years in both houses, but he's nobody's idea of a Bob Byrd or a McConnell who have really mastered the rules of the Senate." Vogel also counted DeMint out as a replacement to McConnell, saying the Kentucky Republican has likely already locked up enough votes to maintain his position as Republican leader in the Senate. DeMint himself is quite frank on shooting down notions that he's looking to tackle McConnell in the Senate. "Anyone who wants to be a leader in the Senate doesn't rock the boat, which is clearly my style," DeMint told McClatchy Newspapers. "I want to continue doing what I'm doing. Leadership is a liability for somebody like me, who's trying to build grassroots support around the country for conservative candidates."